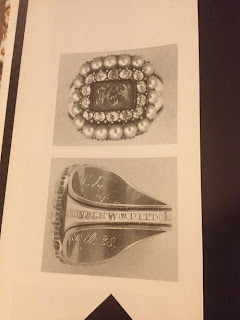 Above are two views of a diamond and pearl memorial ring commemorating Lady Harriot Eliot and her brother, the statesmen William Pitt. Her hair, with gold wire initials HE, are set in the bezel. Inscribed on the back it says Lady Har Eliot Obt 25 Sept 1786 Aet 28. The enamelled hoop bears the inscription Rt Honble WM Pitt Ob 23 Jan 1806 Ae 47. The ring is currently in the possession of Lord & Lady Rosebery at Dalmeny House Estate, South Queensferry, Edinburgh. Scarisbrick, D. (1993) Rings: Symbols of Wealth, Power and Affection, p. 186.